Chairman of the Board, CEO, and Founder of Piedmont Pharmaceuticals, Roland H. Johnson has 30 years of experience in the pharmaceutical industry. Johnson was one of a small team that formed the animal health division within Ciba-Geigy, (which became Novartis Animal Health) where he was critical in inventing, developing, and launching the three blockbuster products: PROGRAM®, INTERCEPTOR® and SENTINEL®. In 1996, Johnson launched a new animal health company, Blue Ridge Pharmaceuticals, which was successfully sold to IDEXX Laboratories in 1998. Eleven of the 13 product development projects started at Blue Ridge ultimately came to market. In 2001, Johnson founded Piedmont Pharmaceuticals to invent, develop, and market both human and veterinary pharmaceuticals. Skilled at forging partnerships, Johnson has spearheaded out-license agreements for several of Piedmont’s animal health products to Bayer Animal Health, Pfizer Animal Health, and others. In recognition of his service, Johnson received the Award for Entrepreneurial Excellence in 2005 and 2008 from the Triad Advisory Committee of the North Carolina Biotechnology Center. Johnson was a regional finalist (NC & SC) Ernst & Young Entrepreneur of the Year award in 2007 and 2009. 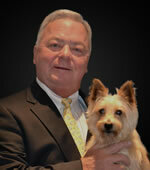 He served on the board of directors of the North Carolina Veterinary Medical Foundation from 2004 to 2012. Johnson has actively served as a Director of the Western Carolina University Foundation Board since 2002. Johnson earned a BS degree from Western Carolina University and his MBA from Central Michigan University.